Our first product is natural-grade nootkatone made by biotransformation of natural valencene. 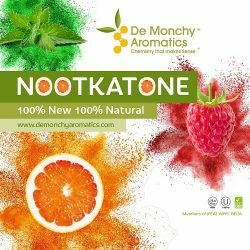 Nootkatone is the flavour and scent of grapefruit. We can supply this at purity grades from 50%, 60%, 70%, 80% and above. Valencene is a citrus extract readily obtained from oranges. Since this is a naturally occurring material and since we convert it to nootkatone using an enzymatic process, our product is designated ‘natural’. Valencene is available from multiple sources so we are able to offer security of supply of our nootkatone product. For more information contact us at sales@oxfordbiotrans.com or our distributor De Monchy Aromatics for more information. We will exploit our novel approach to P450 enzyme design to develop further processes and deliver additional products. Oxford Biotrans has already identified several further high-value flavour products, accessible via our technology, where the feedstock is a relatively low cost, natural material with ready availability. We intend to realise scalable, ‘green’, biocatalytic processes for these products. We have exclusive access to an extensive library of patented, custom-designed cytochrome P450 enzymes that have high selectivity for specific substrates and yield products with high efficiency. © 2019 Oxford Biotrans Limited. All rights reserved.